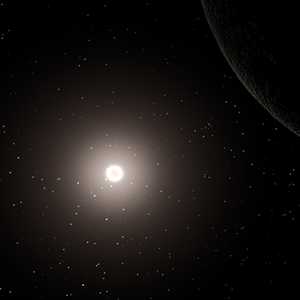 Eutopia's star, Smith, is a dull main sequence star orbited by three planets and one broad asteroid belt. The system is smaller than that of many comparable stars, some to suspect that a fourth planet was ejected from the system during formation. The nearest planet, Friedman, is a charred rock tidally locked with Smith. Extremely iron-rich, it may have been a planetary core exposed during an impact event or stripped away by the harsh solar wind. The next planet, Rand, is a terrestrial world with an atmosphere of carbon dioxide, ozone, and free nitrogen, racked by frequent and violent storms. Some relatively calm regions exist, but the planet's surface is constantly resurfaced by nitrous acid rains and electrical discharges. The final planet is a green-blue gas giant called Ricardo, orbited by a number of small moons and captured asteroids as well as a small ring system. Ricardo dominates its local neighborhood and contains a variety of substances, including a Titan-like cryovolcanically active hydrocarbon moon (called Malthus). The Main Belt of this system exists just inside of the orbit of Ricardo, with occasional asteroid migrations between it and Ricardo's L4 and L5 points. Unusually dense, it is here where the main colony of Eutopia was founded, and the whole belt is often referred to by this name. Eutopia proper is a oversized pair of toruses that rotate for centrifugal gravity, although the station also includes various nearby constructions, often smaller torii. All infrastructure in Eutopia is privatized and, frequently, run by competing free market agencies. This results in most constructions on Eutopia not dominated by a single large corporate interest having a ramshackle look to them, as various parts of a given station are smashed together more or less by happenstance. The parts of Eutopia that aren't jarringly irregular are frighteningly regular, as these tend to be regions controlled by low-intelligence drones. In between Eutopia's two torii is a spaceport capable of maintaining and fielding some of the fastest ships in human space. Shuttles from this station tie together the region's economy and ensure economic dominance by the station proper. Nearly 600,000 people live in the greater Smith system, with the majority of these being found on Eutopia proper. Of these, 8% are landowners, 15% are indentured servants, and the remainder are tenants. The station is overwhelmingly human, with representation by a few Qerr-Katish business interests and an unfortunately large number of positronic indentured servants. Eutopia's primary pull is in banking and entertainment, as suits its nature as a lawless region outside of Sol space. The station features luxury dining, accommodations, and entertainment for the ultra-wealthy, and tax-free Eutopian banks store a huge amount of corporate wealth despite SolGov attempts to stop the practice. Eutopia uses these exports to fuel further internal development. It lacks SolGov's labor protection laws, allowing them to construct vast automated mines on the surface of Friedman and farms in the moons of Ricardo. These eerie autonomous structures produce a huge amount of material for the construction of more orbital habitats, featuring more entertainment and more illicit trade. Eutopia doesn't have a formal government, but as part of a concession made with SolGov to support their continuing independence all residents are obligated to buy in to the Eutopian Foreign Relations Board, a privately traded corporation that oversees technological development. The EFRB maintains their hold on the system by owning and operating the main spaceport, and are renowned for their discretion. Their reports prevent SolGov from acusing the Eutopians of Five Points violations and invading their space, allowing their vast free market to play out with only mild interference. A gray ball cobwebbed by automated trawling factories that refine the planet's natural iron into usable ingots, which are then shipped by courier to orbital processing and shipping facilities. Friedman is an extremely tidy operation, especially for its low level of sapient or A-class oversight. Analysts report that Friedman's factories would continue functioning for 60 years if humans were to be removed from the situation. Rand is full of relatively uncontested deposits of substances necessary to life. It is also a lightning-wracked hellscape too complicated for simple drones to navigated unaided. As a result the majority of laborers on and around Rand are indentured servants, often positronics. The lack of natural infrastructure prevents any sort of coup from occurring, and the high workplace incident rates of the planet are economically acceptable losses. Ricardo's largest moon is owned and operated almost entirely by Skrell. The caste makeup is predominantly Kanin-Katish, with the owners being Qerr-Katish rumored to be affiliated with the Qerr'Glia. The existing Skrellian population spread quickly from a relatively small seed, and the moon is covered with high-density hydroponics stations, plastic production plants, and geothermal power stations using systems more advanced than any in SolGov space. An informal name for a collection of privately-owned power stations that ring Smith, the Halo is a vital piece of Eutopia's infrastructure. Power is relayed to the high-population outer rim using colossal microwave lasers. The various owners of the Halo occationally publish reports on their military readiness, with the clear indication that, if any power attempts an armed invasion of Eutopia, the solar energy will be used against invading fleets. A Mercurial collective run under the nose of the most obviously corporate power in the galaxy, the settlers of Kroptkin farm grain and process food on one of Ricardo's smaller moonlets in exchange for the influx of mechanical parts required to keep their habitat functional. Kroptkin's bread is considered a local delicacy, the group's corporate customers luxuriating in their disdain. This page was last edited on 30 August 2018, at 22:03.